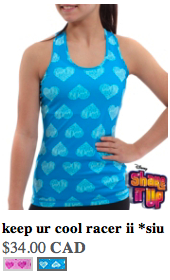 Ivivva, little sister company to Lululemon has collaborated with Disney to create a line of dance clothing called Disney’s Shake It Up. I do find Ivivva quite pricey for children’s clothes but I also find the clothing really adorable for that pre teen age. The sizes start at 4 and go to 14 but I probably wouldn’t buy items for my 4 year old just yet as I prefer something a little more wholesome and young while I still have a say in what she wears, that being said I do think the clothes are cute and appropriate for that tween age when they are in search of something that pushes boundaries a little bit. It’s just feminine enough without being too revealing and it’s still quite girly. Once she’s a little bit older (say 12-14) and regularly in sports I do see myself getting her a few items here and there, preferably the hoodies ;p Do you moms approve of Ivivva for your daughters? Price wise and design wise? "Run: Switch Back 1/2 Zip"